The SHOCKWAVE™ Lineman's 3 in 1 Utility Socket provides more secure, efficient fastening in all fastening environments and orientations. The socket features a 3 in 1 square design for single sided fastening, eliminating the drop hazard of removing the socket from the adapter to change sizes. The Push and Twist Barrel Lock allows for secure, one-handed size changes, even while wearing gloves. The socket features an interior debris shield that resists interior rust and corrosion from dirt, wood chips and moisture from the jobsite. Distribution Utility Socket for use 3/4", 1" and 1-1/8" square nuts. Push and Twist Barrel Lock for secure, one handed size changes. 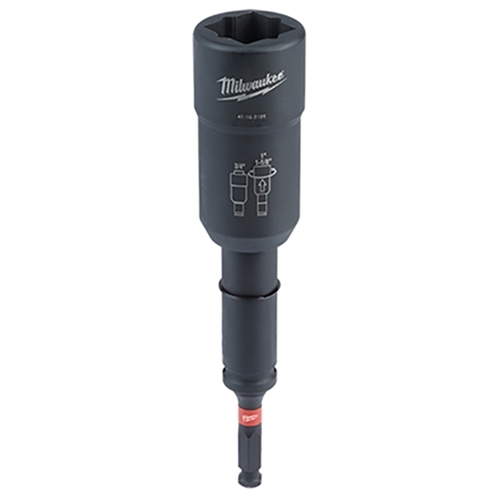 Milwaukee Distribution SHOCKWAVE™ Linemans 3 in 1 Utility Socket has a rating of 5 stars based on 2 reviews.